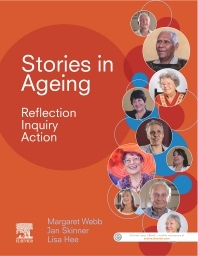 Stories in Ageing presents an insightful collection of personal stories as told by a range of older people, carers, health professionals and family members. This valuable resource builds empathy and understanding, and provides examples of innovative approaches to care with a focus on reflection, inquiry and action. The teaching and learning strategies assist in developing skills, attitudes and mindfulness around ageing, with a strong focus on a person-centred and lived approach. • Including 10 chapters, each presenting a variety of stories from consumers, carers and healthcare professionals around a range of topics related to ageing. • With 19 video stories presenting personal accounts from a range of lived experiences. • Reflection, inquiry and action provide the framework for the teaching and learning strategies for each story, aimed at certificate, undergraduate and postgraduate levels. • Weblinks, references and readings are included for further reading and research. • Transcripts of all interviews are included in the back of the book and online. • The Evolve online component features all content from the workbook with the addition of the embedded videos.